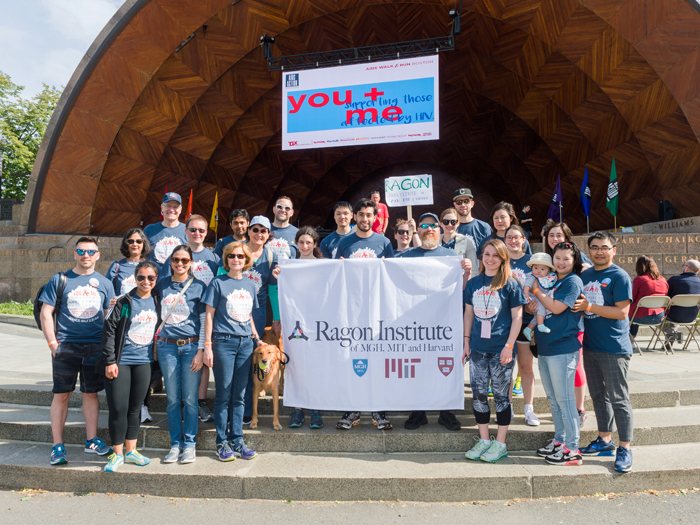 For the first time, long-time participant, the Ragon Institute of MGH, MIT and Harvard is the top fundraising team of the AIDS Walk and 5K Run Boston with a total of $91,543 raised, the most ever raised by an individual team! The event was held on Sunday, June 4, 2017 and drew thousands of participants to the DCR Memorial Hatch Shell on the Esplanade for a 4.85-mile walk and competitive 5K Run. Boston Mayor Martin J. Walsh opened the event with the announcement of Boston’s commitment to join the Fast-Track Cities Initiative, a global campaign to end HIV transmission. But for Team Ragon and Team Leader, Gaby Berger the work began months earlier. With an ambitious goal to raise $80,000, the Team worked tirelessly reaching out to donors and sponsoring fundraising events. Additionally, Ragon Institute Director, Dr. Bruce Walker, created the Director’s Challenge in which he committed to match contributions raised by team members who raised at least $100 by May 22. This year’s even was particularly significant because Dr. Walker received the Heroes in Action Award, which he was awarded during the opening ceremony. This award honors those who have made significant and lasting contributions to the fight against HIV/AIDS in Massachusetts. Dr. Walker was recognized for his groundbreaking research into a cure for AIDS, his HIV work in South Africa, and his support of AIDS Action Committee. Team Ragon would like to thank all the donors who supported us and the work of the AIDS Action Committee. And if you have not donated yet, there is still time to donate to prevent new infections and maximize the health outcomes of those infected here in Massachusetts.